Marie Adorno is the Assistant Director of the DNS Program and is an Assistant Professor of Clinical Nursing at Louisiana State University Health Sciences Center New Orleans School of Nursing. She received her Bachelor of Science in Nursing from Louisiana State University Health Sciences Center. She received her Master of Science in Nursing in Parent Child Health from Louisiana State University Health Sciences Center and her Doctor of Philosophy degree in Higher Educational Administration from the University of New Orleans. Dr. Adorno is a Clinical Nurse Specialist in Maternal-Child Nursing and is an Advanced Practice Registered Nurse. She is certified as a Maternal Newborn Nurse from the National Certification Corporation for the Obstetric, Gynecologic and Neonatal Nursing Specialties. She is also certified by the National League for Nursing as a Certified Nurse Educator. Dr. Adorno serves as Course Coordinator for Health Assessment Theory, Health Assessment Lab, and Introduction to Professional Nursing for Undergraduate Baccalaureate Students. She teaches Theory Development in Nursing to graduate students in the DNP and DNS programs. She also serves as a DNP project team member to assist students with implementation of their DNP projects. She serves as a faculty advisor to students and is a mentor for the MUSES program. She has clinical experience in surgery, ICU step-down, and Mother-Baby units as a staff nurse. She is active in nursing professional organizations. She is the President of the Epsilon Nu Chapter of the Sigma Theta Tau International Honor Society of Nursing and maintains membership in the American Nurses Association, Louisiana State Nurses Association, New Orleans District Nurses Association (NODNA), and National League for Nursing. 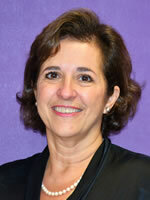 She has served as Faculty Advisor of Sigma Theta Tau and as President of the NODNA Organization. The NODNA organization recognized her as one of the 1999 Great 100 Nurses. In March 2015, she was an Item Writer for the National Council Licensure Examination (NCLEX). Currently, Dr. Adorno is an Associate in the Teaching Academy at LSUHSC and is a board member of the Academy's Executive Council. She is also a member of the joint LSU Health School of Nursing and UMC Research Council Committee;a member of Children's Hospital Evidence Based Research Council, and a member of the Research Review Committee for UMC. Adorno, M. (2018). Management of sepsis in the Obstetrical Patient. Critical Care Nursing Clinics of North America. Tartavoulle, T., Adorno, M., Garbee, D., Kensler, P., Manning, J., & Pierce, S. (2018). Predictors of success in BSN students. International Journal of Nursing Education Scholarship, 15(1), 1-8. Adorno, M. (2017). Delegation: Legal aspects. MEDSURG Nursing: Journal of the Academy of Medical-Surgical Nurses. 26(5): 12-13.